Wed, Feb 6, 2019, 11:30 pm SL Time, ColomboPage News Desk, Sri Lanka. Feb 06, Colombo: The Indian Navy's hydrographic survey ship "INS Jamuna" departed the island after successfully completing a joint hydrographic survey in Sri Lankan waters, today (06 February). 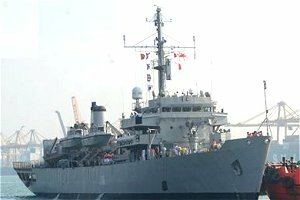 According to Navy media, INS Jamuna, was accorded a traditional farewell by the Sri Lanka Navy upon her departure from the Colombo harbor. INS Januna, arrived in Sri Lanka on 20th December, is an 85.77m long and 12.82m wide ship, manned by a crew of 230. During their stay in the Sri Lankan waters, the crew of INS Jamuna engaged in the joint survey mission with Sri Lanka Navy and successfully completed it covering the sea area from Colombo to Galle. Further, they participated in several activities organized by Sri Lanka Navy.